Four Seasons Resort Oahu at Ko Olina, the newly opened luxury resort on Oahu’s sunny leeward coast, introduces an island flavour to the Resort’s reputation for lavish weekly brunch celebrations with the launch of Brunch on the Beach, a six hour long Sunday food extravaganza at Fish House from 10:00 am to 4:00 pm starting October 30, 2016. The Resort’s signature line-to-table dining outlet Fish House is taking a casual and fun approach to Sunday brunch with menu choices that include Chef Ray German’s famous seafood tower (manini and ohana size) and a special a la carte menu featuring “50 First Dates” lilikoi pancakes, lobster chilaquiles, a Fisherman’s Hook Daily Catch and “The Garden of Eaten Greens” (think pickled kobocha, goat cheese and hazelnuts). Guests can choose a dish from each of three different menu sections for a prix fixe price of USD 46 and add seafood enhancements such as Ray’s Michelada, crackling and skippers oysters. Ruinart Rosé Mimosas served by the cart and a Make Your Own Bloody Mary Bar round out the options. The all-day affair features a supervised Keiki KidZone directly above the restaurant in the Aloha Lounge, with hula lessons and lei making, crafts, charades and more, allowing parents to relax and enjoy the bluesy groove of Tavana, toes in the sand. Starting Sunday, October 30, 2016. Cost: USD 46 per person. Teens USD 16. Children between the ages of 5-12 are USD 8 and children under 5 years of age are free. Reservations are available online on Open Table, or by calling 808 679 0079. Echoing the casual So-Cal flair of Brunch on the Beach, Fish House is a lively line-to-table seafood restaurant, set at the edge of Ko Olina’s white-sand lagoons. As its name implies, Fish House showcases the very best in fresh island fish, combining expected and unexpected flavours. It’s a rustic, casual approach to dining, capturing vibrant flavours from land and sea in an abundance of seafood choices. Chefs work directly with island fishermen and farmers along the Waianae coast, guaranteeing the freshest quality ingredients, sourced locally just miles from the Resort. 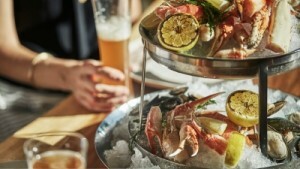 Signature items include gigantic seafood towers, Hawaiian-style poke, king crab and lobster feasts, with loco moco and other island favourites served in refreshing new ways as guests dine beachside on tiered decks with panoramic ocean views. Born and raised in Southern California, Chef Ray German grew up steps from the ocean and stepped into the culinary world as a kitchen steward with Four Seasons Resort Aviara in San Diego at the age of 17. His strong work ethic made an impression on Executive Chef Pascal Vignau, who became a role model, inspiring German to pick up a knife and test his natural ingenuity for sweet and savoury combinations. The young chef never looked back. With Vignau, German developed the essential skills and techniques of the kitchen. His keen palate for flavour propelled him to the role of apprentice cook at Vignau’s new restaurant, Savory just one year later. After five formative years in Southern California, German ventured out on his own on a culinary adventure throughout the United States.